Learn how to write a single page app to quickly visualize all of your objects and the information about them using JSforce, Angular and the Metadata API. When working with a large organization, you get to a point where you have so many objects and so many fields that it can be almost impossible to keep track of them all. It can be very time consuming to dig through the setup menus to find field and relationship names. To help combat this you can use JSforce and Angular to write a single page app to quickly visualize all of your objects and the information about them. All of your objects are listed and quickly filterable. After selecting an object from the side nav bar you can see lots of information about the object. 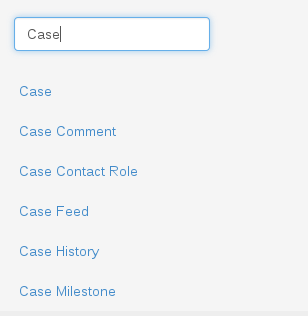 All of the fields, their API name, type, and description are also displayed, and are filterable and sortable. All of the related objects are also listed, including the elusive relationship name. Create a new VisualForce page called objDescMainTmpl with this content. Create another VisualForce page called objDesc with this content. Visit the objDesc VisualForce page to use it. Create a new VisualForce page called objDesc with this content. If you plan on expanding this app, the multipage will make editing the layout much easier. This app is quite simple and JSforce does most of the heavy lifting for us, and Angular does the rest. Here we setup our JSforce connection with the Session_Id of the current user. This code sets up our templates and routing information. So if we update the hash to be #/Case, we will load the object description HTML and then activate our ObjectDetailCtrl method to fetch the rest of the data. When the app starts with no parameters, we start by just loading the list of objects. This sets our $scope.loading_sidebar variable to true so we can show the loading animation. Then we get a description of all of the sObjects from the describeGlobal method of JSforce. This then gets set on our $scope.objects for us to use in the sidebar HTML. In our sidebar HTML we set the ui-sref attribute, which will update our route when clicked. The code is called when we have an object and want to get its information. The describe method of JSforce returns all of the metadata for the requested object (stored in $stateParams.name). This then gets stored as $scope.current_object for us to use in the display. This app shows how you can display lots of important data about your organization’s metadata with very little effort. With the framework setup here, the sky is the limit since you have almost full access to almost all of the APIs that the Salesforce Platform offers. Patrick is a full-time Salesforce developer at Red Hat. He spends most of his spare time developing open source software and helping in the community.